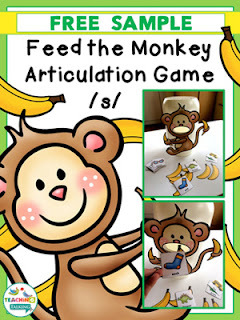 Speechie Freebies: Articulation Feed the Monkey! 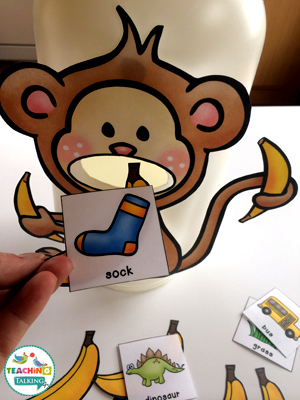 This adorable freebie is certain to get your students excited about working on their articulation goals. After creating your “hungry” monkey, your students practice saying each target word. Once they say the word correctly reward them by allowing them to feed their fun friend a banana. In this sampler you will receive a sheet of full color cards to target /s/, printable monkey character, a sheet of bananas & several game suggestions and ideas. Check it out here! If you enjoy this freebie the full pack includes color & black line cards for 24 sounds to cover all the sounds your students need. This huge pack also contains several other print & go activities for each sound.